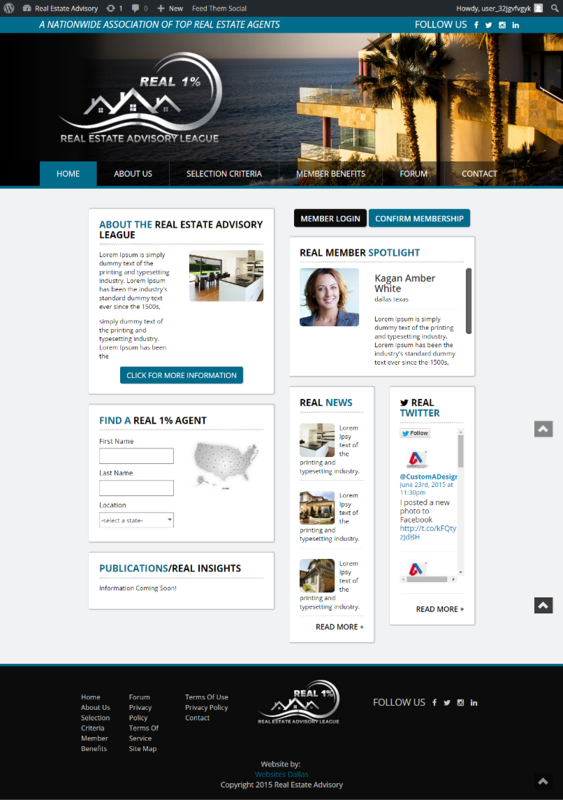 The Real Estate Advisory League came to Dallas Website Design interested in developing a new website for an invitation only association of Real Estate Agents. We previously developed a similar website for the Legal Profession for one of the 2 individuals involved in this venture. We started by having our design team create a custom design concept, then built the website in the WordPerss Content Management System, so that the client would be able to easily administer the website and membership, as well as updating or making changes to the website as needed. We also built the website to incorporate Responsive Web Design, so tehat the site would display properly and look great on any device and in any browser. The website includes a number of features and functionality we developed specifically for the Real Estate Advisory League, such the ability to upload membership invitations in bulk and populate the database with invitation information. The membership module was coded from scratch as there were no off the shelf solutions capable of providing all functionality requested by the client, such as the ability to search for members by Name, State or by Distance. We also incorporated the ability for members to show their property listings with Zillow and Trulia directly within their profiles on the Real Estate Advisory League Website. Once the website development was complete, we then went about optimizing the website to insure fast page load speeds and for ranking well in Search Engines. The image below is a screen capture of the performance rating on GTmetrix, which is a well respected website that rates website performance and page load speed.